Sushila (right) with her two colleagues. In a small village just off Arniko Highway in Bhangeri Kavre,is Janajyoti Primary School. 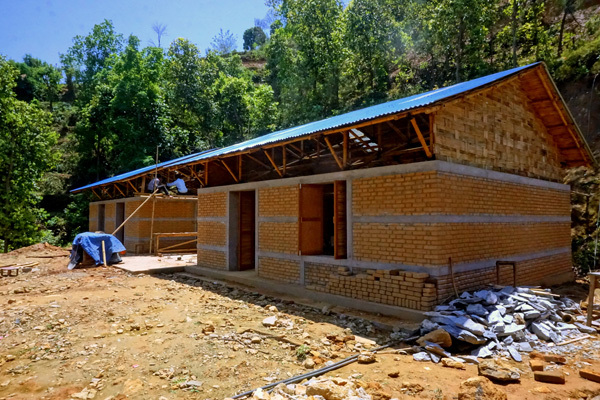 This government school which is accessible by road only in a dry season serves 40 students who come from the neighboring Tamang and Dalit village. Sushila Ghoresaine, 34, runs the school and is one of the few young female principals in the country. The school had only 2 classroom blocks, which were completely destroyed by the April 25th earthquake. When we approached the school, she and her two other female colleagues were teaching the students out in the open. The school is remote and out of radar of the Education authority or INGOs because according to Sushila,"they want to work in schools that have good road access and public visibility." Sushila has been fighting for last 5 years to keep the school alive, as the lack of government budget made the student numbers shrink from 150 to 40. She and her collegue even shared their salary so they could hire another teacher. The earthquake was another blow to her dreams, without infrastructure she would have been forced to relocate the school. Meanwhile, we had asked the Department of Education to recommend a school that is overlooked by other organizations and was not easily accessible by road. When we saw the conditions of the school, we were very humbled by the determination of Sushila to run the school despite having even the most basic infrastructure. We decided to put all our effort to help her and the school. Meanwhile, we had asked the Department of Education to recommend a school that is overlooked by other organizations and was not easily accessible by road. When we saw the conditions of the school we were very humbled by the determination of Sushila to run the school despite having even the most basic infrastructure. We decided to put all our effort to help her and the school. 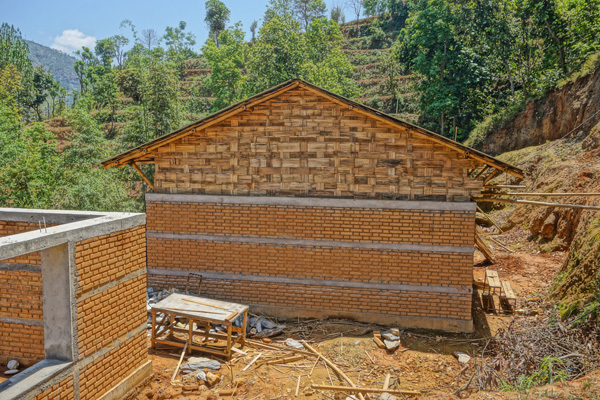 The initial objective of the project was to, while building the schools, train local community on new technologies and skills to build earthquake resistant homes using locally available earth and bamboo. Introducing new technology is not an easy process, whether it is an high-tech product for an educated urban crowd or a new farm device for a rural farmer . Communities always ask critical questions regarding the performance, durability, cost, maintenance etc of any new system. Rural farmers and artisans are especially more critical because they can not afford to invest in a new product without being absolutely sure of its utility. Furthermore, no product can meet the need of the user at the first go, product development is an iterative process. For example, since last year, we have been working on a brick press so people can make earthen bricks using materials right of their building site. We made thousands bricks of different sizes, shapes and material composition. Our designers and builders were constantly on construction sites getting invaluable insights and feedbacks from the communities. In this constant dialogue we changed the system so that the bricks are easy to make, repair and test. We devised simple system to test bricks strength and durability. Our system is open source, so people can add/remove components as they want. In one of our machine, some masons added a frog in the brick and put the construction date on it. We are so happy to say that we have found our early adopter in this village of Bhangeri Kavre. Saila Tamang is a young lady, who comes from a modest economic background. She was so impressed with our bricks that she employed young masons who we had trained during the construction process. The masons, hired the machine at a modest Rs. 100 (USD 1) per 1000 bricks, which we had donated to a local cooperative. She has now made 6000 bricks and is waiting for the next government installation to start her work. This is one of the most rewarding story of our construction journey. AVAAZ's contributed 1200 square feet construction is complete. Play space is being installed. It will complete by May 15th. 15 homes are being made with the machines and the techniques that were disseminated during the construction process. Eco-sys Hong Kong and other friends have decided to add another school block in the project, using the same technique. The walls are complete.